I’ve always liked the flavor orange. While other flavors like raspberry and strawberry have usually reigned supreme in most flavor face-offs, goodies like orange skittles, orange-flavored water spritzers, and orange sherbet have always proven tasty for my sweet tooth. However, out of all the orange-flavored goodies out there, there have always been two that hold a special place in my heart. One of those is orange soda. Did anyone else ever watch Kenan & Kel? Remember the “Kel loves orange soda” skit? Well, I think I loved orange soda just as much as he did. Granted, I didn’t drink as much as he did, and I’ll only drink it on occasion now, but it’s still a welcomed treat. Another thing I’ve always loved? Orange creamsicles. Growing up, we actually used to get these orange push-up pops from what we referred to as “The Schwan Man.” He would drive through our neighborhood with his truck and deliver the coveted creamy pops that we enjoyed on warm summer days in between playing games of hide & seek and riding bikes. So now that the weather has started to heat up, and considering my immense love for cupcakes, it only seemed logical to recreate my favorite flavor in cupcake form. Preheat oven to 350 degrees F. Line muffin pans with paper liner or spray with nonstick cooking spray. 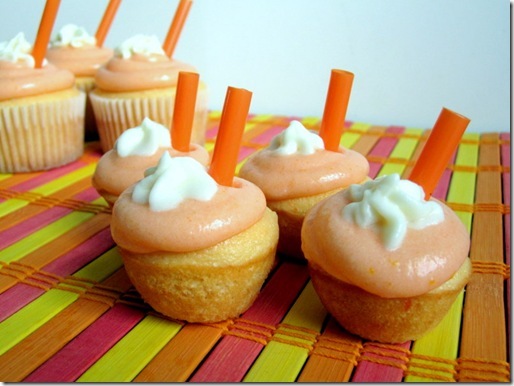 Set aside 1-1/2 teaspoons of the orange jell-o for the Cream Pop frosting. In a mixing bowl, beat the remaining jell-o, cake mix, pudding mix, orange juice, eggs, egg substitute, applesauce, and vanilla. Spoon batter into prepared muffin pans, filling each about 2/3 full, and smooth tops. Bake for 15-18 minutes or until a toothpick inserted in centers comes out clean. Cool cupcakes in pans on wire rack for 5 minutes; remove from pans and cool completely. Spoon orange-flavor Cream Pop frosting into a pastry bag fitted with a large round tip (or use a sandwich baggie with the corner tip cut off). 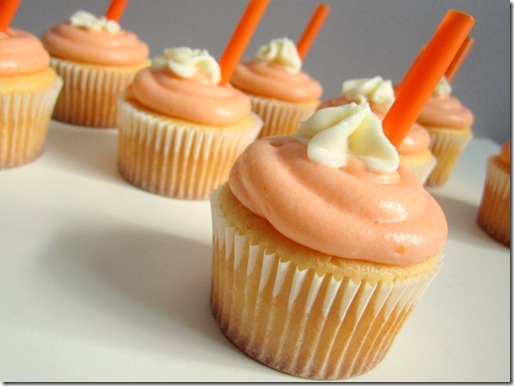 Spoon the vanilla-flavor Cream Pop frosting into another bag fitted with a small star tip. 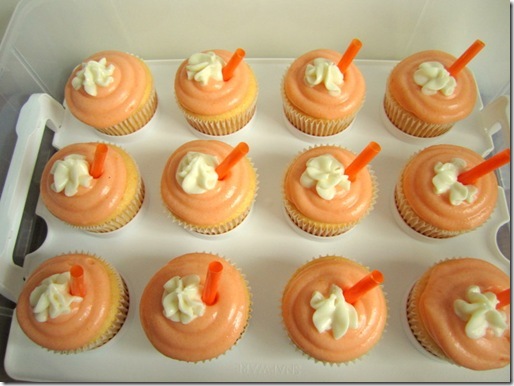 Pipe orange frosting onto each cupcake to cover the top. Pipe a medium-sized star of white frosting onto each cupcake. 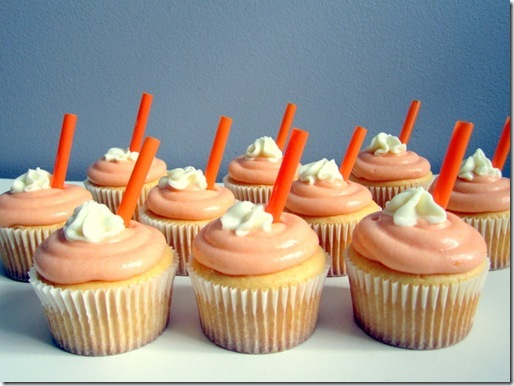 If desired, insert a plastic straw into top of each cupcake. ENJOY! Beat cream cheese, butter, and 2 tsp vanilla until light and fluffy. Gradually add confectioners’ sugar until desired consistency is achieved. Place ~3/4 cup of the frosting in a separate bowl. To the remaining bowl of cream cheese frosting, add the reserved orange jell-o and orange peel. Beat to combine and frost as directed above. *The original recipe called for 4 eggs- feel free to use all 4 or substitute all egg substitute. 4 eggs = 1 cup egg substitute. Upon first bite, my #1 taste-tester (aka, hubby) gave a huge roll of the eyes, followed with a “Oh my god, Courtney, they actually taste like a real creamsicle.” Coming from him, this is quite a compliment, since he’s usually pretty low-key with his praise. As usual, these baked goods were brought in with hubby to share with his co-workers. I’ve since been told that these are now the top favorite, which have jumped the rankings from this original #1 batch. And just in case you didn’t notice, did you realize that these guys are healthified? Not much (I mean, they are still cupcakes with frosting and all), but a few simple tweaks helped make these slightly less guilt-laden. Mini cupcakes are always a hit and taste just as good as the big guys. Just don’t say I didn’t warn you about trying to twice as many…you know…because they’re mini. What is your favorite “flavor” of treats (i.e., orange, strawberry, grape, etc.)? These look great! First thing that came to mind when I saw the title was Kel! Faavorite flavor treats are a toss-off between orange, grape, or blue raspberry! Adorable! I love the little straw also. You are too clever! Those look awesome Courtney! I'm so glad I'm not the only one who ate orange push pops from the Swchans man! Totally remember those, and the root beer float popsicles! I immediately thought of Kenan & Kel when you mentioned orange soda - oh, childhood shows! These look wonderful - the little straw is a cute addition. I can't believe this is your post today!! I went to Good Burger in NYC this weekend and we kept talking about keenan and kel and the orange soda! Also we bought a creamsicle cupcake from Crumbs!! Too funny!! Oh my goodness, those are the cutest things ever!! Who loves Orange Soda? Kel loves orange soda. I do I do I do-ooooooo. : ) Yes I remember. These look delishious. Love orange cream soda with vanilla ice cream! Those looks amazing!! I love Cherry & Grape flavors as well. So cute! I might try this with root beer flavor... My favorite is grape. Hands down grape. 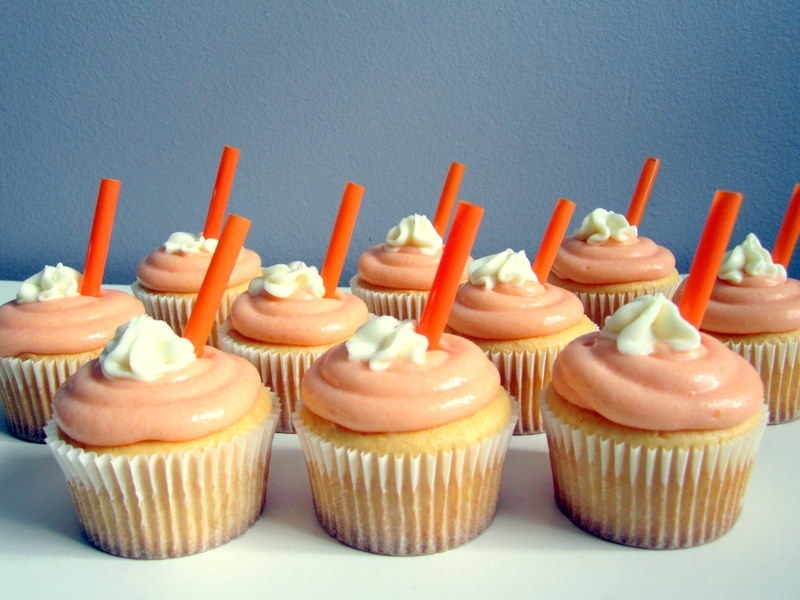 The cupcakes are so cute--love the straws! I haven't thought of Kenan and Kel for years! Too funny. Oh wow, those look absolutely amazing. I may have to break into the baking world so I can have some yummy things like those! whoooah this recipe is incredible. Your baking recipes are my favorite! Now I just need to do one of them. You should healthify cake pops. I tried this weekend and it was mission fail. Check out the twitter page for a sad little pic. My fave flavor is chocolate. Does that count?? These are so precious!!! Is it strange to call a cupcake precious? ;) Love the cream soda idea...I have been making popsicles out of greek yogurt and OJ to get that flavor...SO yummy! WOWZA. Those are beautiful cupcakes!! I totally remember Kel & his undying love for orange soda. Gotta love ALL THAT! I'll definitely be trying the cream pop frosting soon. Any reason you choose Neufchatel over fat free cream cheese? My favorite flavor of treats is usually the cherry or strawberry option in a bag of skittles/starbursts. Whatever the "red" one is. How typical, right? I did notice that they were healthified :) They look yummy! I was never a fan of creamsicles growing up for some reason, odd because most kids loved them! My favorite flavor I think would be raspberry! They're adorable. I can't wait to make them! I actually hated orange soda (still do) but I love creamsicles :) I usually stick to strawberry stuff when it's flavored. It tastes the least artificial to me. Oh my goodness...the orange push pops were always my favorite thing to order from the ice cream truck!! Hahah every time I drink orange soda I do the Keenan and Kel quote... I'm such a child. These look GREAT for summer! 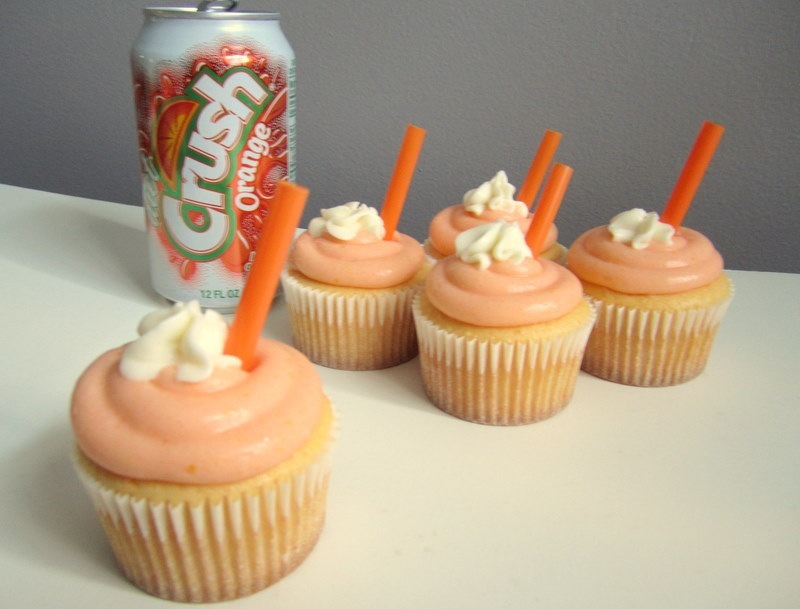 I would have to say strawberry would be my favorite flavors, although those cupcakes make me want to change my mind! I love orange soda, too! OMG these look To-Die-For!! Anything with orange and I am sold...I have to try these out soon! Thanks for sharing. You are so creative with your cupcakes! I can't wait to try these out! I know Craig's co-workers will be much appreciative- they have a strong LOVE for all of your cupcake recipes-- especially the chocolate chip cookie dough ones- quite a HIT! :D Oh, I meant to ask you- did you find your Old Navy capris? Those look so cute! Perfect summer dessert. My favorite treat flavor is strawberry. 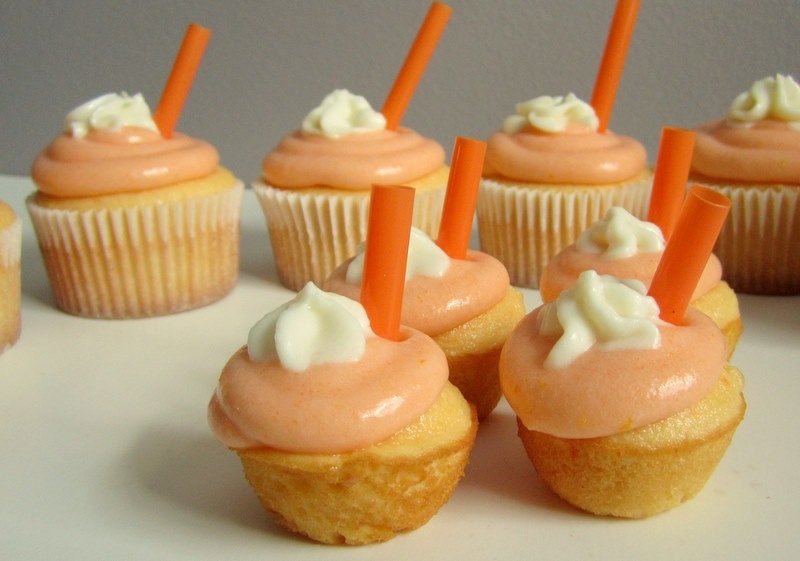 How cute--I love the little straws! My favorite flavor is usually raspberry or lemon. I loved those orange push up pops! I was obsessed with them. Orange creamsicles were also a favorite, so I can imagine how much I would love these cupcakes. They look adorable. Awesome!!! These will be perfect for the baby shower I'm helping with next month. Thanks! And I pretty much like any red or orange flavors (cherry, watermelon, strawberry, orange, etc.). Hate grape! 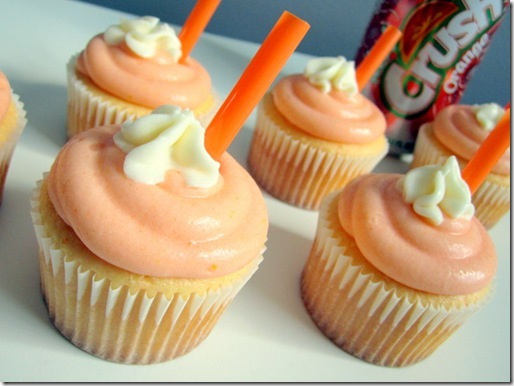 Dan LOVES orange cream soda flavored treats, so I will definitely have to make these for him! oh you have outdone yourself this time! I am 100% making these asap! Thanks for the recipes they sound great and look so cute! Wow! All I can say is wow! I remember orange creamsicles from when I was a kid way back when. It was indeed a treat when the ice cream truck came down the street and mom would let us get one. I can't wait to make these! I friggin loved push pops from the Schwann's Man! I practically chased him down the street! These look awesome! I'm planning on making these for the 4th, but I'm worried about the frosting because we'll be outside and I'm afraid it will melt. Do you have any suggestions/alternatives? Maybe put them in the freezer overnight the night before? Take them out shortly before the party? Or, you could always put whatever container you're keeping them in on ice? Making these today. It will be my first time ever making cupcakes and frosting! Wish me luck! Hello, I love your website! I've been looking into getting one... I wanted to know you designed your cartoon. Haha yep I do! I believe it's Wilton brand. The tips I used were a large round and a medium star. Good luck! Color of this cupcake so cute. I thinks my daughter will be love it! Gosto muito de cupcake, esse parece muito bom, essa receita é muito prática de fazer, vou prepara para meuis filhos.